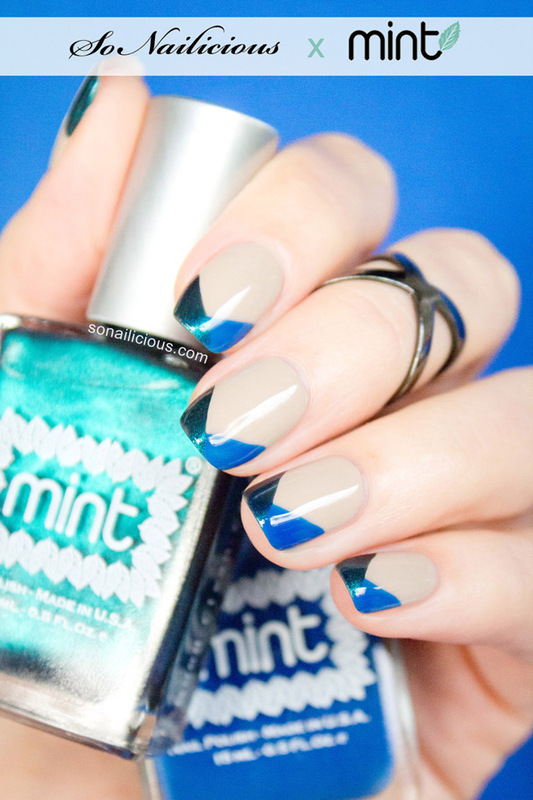 Recently we collaborated with one of our favourite nail polish brands – Mint Polish to create 3 nail art tutorials. We were particularly excited about this collaboration because these polishes are set to become the next big thing in the polish world! The colours are fantastic (remember Czarina? ), the packaging is stylish, and the 5-free, cruelty-free and vegan friendly formula is easy to work with. 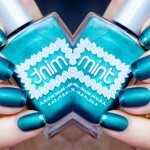 Once you’ve tried Mint Polish, you’ll keep going back! 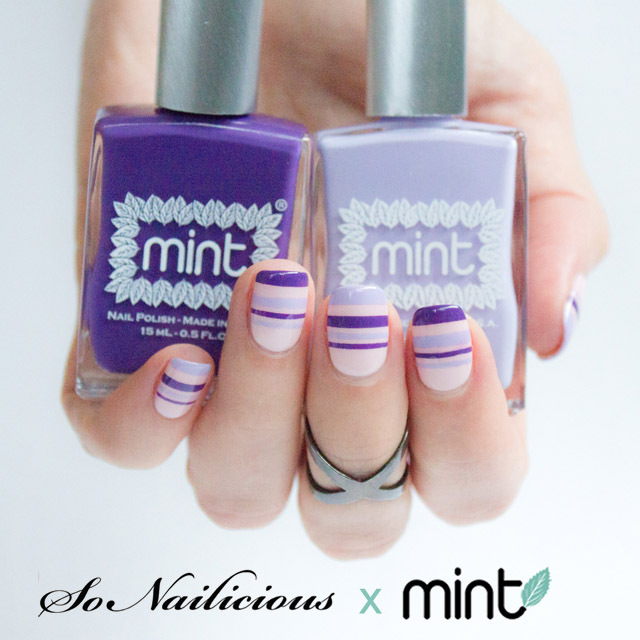 So today we present 3 easy nail art tutorials created for Part 1 of the SoNailicious X Mint project. How to: paint your nails with taupe polish, then paint blue diagonal tips and then emerald tips on all nails using the nail polish brush. Wait a minute or two and seal your design with a high shine (or matte) top coat. Polishes used: Mint Polish Pass the Scone (taupe), Ming (blue) and Czarina (green) for the French tip – all available here. How to: paint your nails with light pink polish, wait till it’s touch dry, then apply striping tape as pictured. 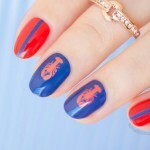 Now work one nail at a time – paint the light lilac and dark purple stripes, then accurately remove the stripes. Repeat on all nails. Wait a minute or two and seal your design with a high shine (or matte) top coat. Polishes used: Mint Polish I Do (pink), Lavender Macaroon and Esmeralda (dark purple) – get them here. How to: see the full tutorial for this drag marble manicure here. 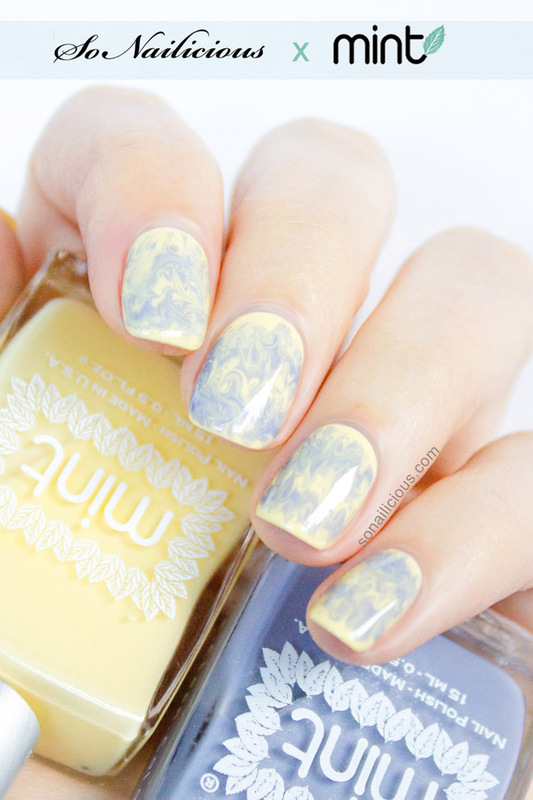 Polishes used: Mint Polish Tart (yellow), Rue Cler (grey) and Wet Look top coat – available here. Which nail colour/nail design is your favorite? And, which tutorial are you keen to try? PS. If you re-create any of these looks with Mint Polish, make sure you tag @So_Nailicious and @MintPolishHQ in your photo on Instagram or Twitter. Greta, Mint Polish founder and I would love to see your work! 3 Unusual Spring Nail Art Ideas With Nail Wraps. Plus, Tutorials!